Zate smo pripravili aromatski dvojček 100% eteričnih olj sivke pridobljene s parno destilacijo cvetov sivke. Za sprostitev ali odišavljenje prostorov. For you, we prepared an aromatic duo of 100% lavender essential oils from our plantations. For relaxing or room scenting. 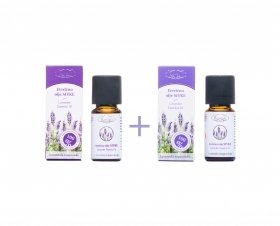 For you, we prepared an aromatic duo of 100% lavender essential oils obtained by steam distillation of lavender flowers when the plant is in full bloom. For the steam distillation of lavender essential oil, we use only the best flowers from our plantations in the Kras (Karst). Lavandula Angustifolia or true lavender essential oil can be used in aromatherapy, to calm, alleviate headaches and insomnia, to disinfect, for burns, abrasions, wounds, insect bites and skin care. It can be used in baths, massage oils, creams, lotions, ointments and for inhalations. Not suitable for consumption. Lavandula x-intermedia essential oil can be used for fragrances in the evaporator or in the manufacture of soaps, ointments or creams. H226 Flammable liquid and vapour H304 May be fatal if swallowed and enters the airways. H315 Causes skin irritation. H317 May cause an allergic skin reaction. H319 Causes severe eye irritation. H410 Very toxic to aquatic life with long lasting effects. P102 Keep out of reach of children. P501 Dispose of contents/container in accordance with applicable regulations. P210 Keep away from heat/sparks/open flames/hot surfaces. - No smoking. P233 Keep in a tightly closed container. P264 Wash contaminated skin thoroughly after use. P273 Avoid release to the environment. P301 + 310 IF SWALLOWED: Call a POISON CONTROL UNIT or doctor immediately. P302+352 IF ON SKIN (or hair): Wash with soap and water. P303+361+353 IF ON SKIN (or hair): Immediately remove/take off all contaminated clothing. Wash skin with water/shower. P305+351+338 IF IN EYES: Rinse cautiously with water for several minutes. Remove contact lenses, if present and easy to do. Continue rinsing. P313+P333 If skin irritation or rash occurs: Get medical attention/care. P337+313 If eye irritation persists: Get medical attention/care. P331 Do NOT induce vomiting. EUH 208 Contains: d-LIMONENE, EUGENOL, GERANIOL, CUMARIN, LINALOOL. May cause an allergic skin reaction. EUH 208 Contains: d-LIMONENE, EUGENOL, GERANIOL, CUMARIN, LINALOOL. May cause an allergic skin reaction. H315 Causes skin irritation. H317 May cause an allergic skin reaction. H319 Causes severe eye irritation. H412 Very toxic to aquatic life with long lasting effects. P102 Keep out of reach of children. P501 Dispose of contents/container in accordance with applicable regulations. P264 Wash contaminated skin thoroughly after use. P302+352 IF ON SKIN (or hair): Wash with soap and water. P305+351+338 IF IN EYES: Rinse cautiously with water for several minutes. Remove contact lenses, if present and easy to do. Continue rinsing. P332+313 If skin irritation occurs: seek medical advice/attention. P337+313 If eye irritation persists: Get medical advice/attention. P362 Take off contaminated clothing and wash it before reuse.